From the velvety jowls of the Neopolitan Mastiff, to the slender frame of the Saluki, to the bouffant hairdo of the Dandie Dinmont Terrier, doggy diversity is on its most glorious display at the Westminster Kennel Club Dog Show. But whether a pup is of sporting, working or toy ilk, they will all need veterinary care at one point or another — and, for the best of the best show dogs this year, Cornell veterinarians were there to provide it. 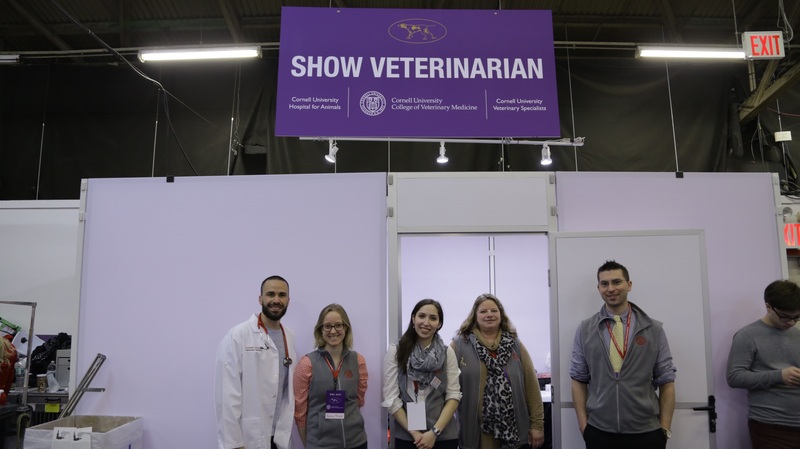 Cornell University College of Veterinary Medicine and its Stamford, Connecticut-based satellite clinic Cornell University Veterinary Specialists (CUVS) are now the official provider of veterinary care at the Westminster Kennel Club Dog Show as part of a multi-year deal. 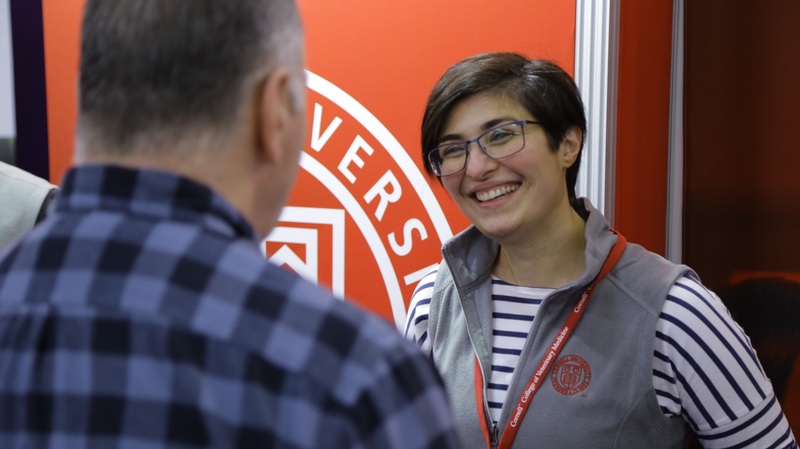 Cornell veterinarians and students made their debut at the event last week, staffing both an informational booth and a veterinary medical care stations at the three-day event. Cornell veterinarians, students and staff stand outside the veterinary care station at the Westminster dog show. The collaboration is thanks largely to Ed Hershey, a longtime board member of the Westminster Kennel Club. After sitting next to Warnick at a Westminster dinner three years ago, the two of them struck up a friendship that led to Hershey’s recommendation that Cornell provide official veterinary care for the show. Hershey pitched the idea to Westminster and Fox Sports, which produced several video vignettes featuring Cornell veterinarians and special canine patients cases. Four of these vignettes aired on the Jumbotron during the Best in Show event in Madison Square Garden, and key portions aired on network television during the event. A Neapolitan Mastiff competes at Madison Square Garden. Education on veterinary medicine carried over to Cornell’s informational booth at the WCK Dog Show. There, college veterinarians and veterinary students chatted with visitors about specialty and general veterinary medicine topics, including theriogenology (breeding and genetics); sports medicine and rehabilitation; and dentistry and oral surgery. Each day of the three-day event, hundreds of show-goers stopped by at Cornell’s booth to ask questions or simply share how much Cornell had made an impact on them and their pets. Brian Collins, D.V.M. ’94, section chief of the Community Practice Service at the Cornell University Hospital for Animals (CUHA), fielded a series of questions, ranging from raw diet, to toenail injuries, to intrahepatic liver shunts. Third-year veterinary student Amanda Stewart and Brian Collins, D.V.M. '94, chat with visitors to the Cornell information booth. Bruhns and her fellow veterinarians and students saw a range of issues, from non-serious conditions such as a light limp and diarrhea, to the more concerning — including a possible case of pyometra, or infection in the uterus. “That was the one case we sent out to get immediate medical attention,” she said. Dr. Nadine Fiani provided show goers with information about her specialty, dentistry and oral surgery, as well as other veterinary care topics. With both dog lovers and Cornell veterinarians learning from one another, the Cornell-Westminster partnership promises to be a fruitful one for years to come. At the 2019 Westminster Kennel Club Dog Show. Photo by Esy Casey.